4. Bonuses will be credited to the Player’s Real Account as Bonus Balance, until the terms of the promotion have been met. Thereafter the applicable Bonus Balance will be transferred to Withdrawable Balance. 6. Following the redemption of a sticky (non-cashable) bonus, if the player wishes to make a withdrawal which is greater than their deposit, they must have an amount greater than the sum of the deposit + bonus. For example, if a player makes a purchase of $100 US and receives a bonus of $100 US, then requests a withdrawal of $190 US, this will result in $190 US being returned to the player’s casino account. The player will only be able to withdraw again once their balance either exceeds $200 US or when the promotion is removed. 7. A promotion is considered completed when a player meets the wagering requirements or when the balance reaches below $0.50. Note that if you are playing a promotion with a maximum cash out limit, upon completing the wagering requirements only the maximum cash-out amount will be transferred to your Withdrawable Balance. Any balance over this amount will be automatically deducted by the system. 8. Players with one or more pending withdrawals currently in their account are not eligible to receive any bonuses, promotional or otherwise, until such withdrawals are either processed or cancelled. Abuse of this policy, as defined by the casino, may result in cancellation of the player’s winnings. 9. . A promotion cannot be used in conjunction with any other promotional offer or existing account balance. If you happen to redeem bonuses on top of an existing playable balance, any winnings will be voided and original deposit reimbursed in your account. All promotional offers are only available to those players to whom the offer was issued directly by the casino. Promotional offers by email are for the intended recipient only and cannot be transferred. 10. Bonuses may be refused at the discretion of the management if abuse of promotions is suspected. All withdrawals will be audited and refused where there is suspected fraud at the casino management’s discretion. 11. The Company reserves the right to amend these Terms and Conditions at any time without notice to you. Such amendments will be effective immediately upon being posted in this “Terms and Conditions” section of the web site. It is your responsibility to review the Terms and Conditions on a regular basis and to check any additional rules detailed within promotional emails. Should you be unclear about any point relating to a specific promotion, it is your responsibility to contact the support team and gain a full understanding before partaking in a promotion. 13. The management reserves the right to disqualify certain countries or individual players from promotional offers. Promotional offers via email, telephone or mail are extended only to the player whom the correspondence is addressed. Players from BULGARIA, UNITED KINGDOM, GREECE, HUNGARY, INDONESIA, MAURITIUS, POLAND, PORTUGAL, ROMANIA, RUSSIA and SWEDEN can not claim any bonus offers at the casino. 14. The Terms and Conditions contained herein represent the complete, final and exclusive agreement between you and the Company and supersede and merge all prior agreements, representations and understandings between you and the Company with regards to the claiming of any promotional or bonus offers. 15. All deposit bonuses are cashable at Sloto’Cash! Free no deposit bonuses hold a maximum cashout limit which is 5x the bonus amount unless otherwise specified..
16. Please note that bets placed on Roulette on color Red and Black are not allowed, if contrarily any winnings generated will be voided. Also bets placed on European Roulette with an active bonus are not allowed. 18. Wagering requirements for our deposit bonus coupons are 30 times the sum of the deposit plus the bonus, unless otherwise stated. Wagering requirements must be fulfilled for each and every deposit bonus used. This rule will only be annulled after the customer’s balance has reached $0 again. 19. Winnings generated from ANY of our deposit based reward bonuses (Weekly, Monthly, Yearly, Sloto Magazine, Snail Mail or any other) will not be honored if the awarded deposit is below $20. 20. Customers cannot redeem multiple free bonuses/free spins offer consecutively: When a customer uses two or more free bonuses without making a real money deposit in between, management reserves the right to void any bonuses and winnings. Sometimes Sloto’Cash Casino will have promotions going on which players will receive a bonus with no previous deposits required. (E.g. Free Money). Below you will find the rules that players must follow when it comes to free money promotions. The maximum redemption amount that players can obtain due to winnings made from existing and previous free money promotions is $180.00 USD. Any funds left from free winnings will be immediately removed from the player’s account after processing the payout. The person who tries to go above this limit will have the funds removed from his/her account. Withdrawals from free bonus promotions of $25 to $50 are only processed when a copy of a utility bill is received, matching the address registered on your Sloto’Cash account. Players from the following countries do not qualify for the free no deposit bonus. Albania, Armenia, Azerbaijan , Belarus, Bosnia and Herzegovina , Brazil, Bulgaria, Croatia, Hungary, Indonesia, Kazakhstan, Kyrgyzstan, Latvia , Lithuania, Mauritius, Macedonia, Malaysia, Moldova, Montenegro, Poland, Romania, Russia, Slovakia, Slovenia, Tajikistan , Turkmenistan , United Kingdom, Ukraine, Uzbekistan. 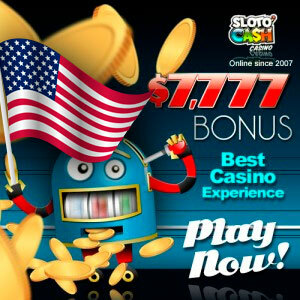 Sloto’Cash Casino is aware that some free bonus links may be posted in other sites or throughout forums or the information that the potential player received has been sent to others who didn’t receive it. If Sloto’Cash has enough grounds to prove that a player did NOT receive that particular promotion through the exclusive means that this promotion was sent out to, we will not honor any payout requests from the player, even if he/she has met wagering criteria. In the interests of fair gaming, there are limits on the maximum bet sizes you can place during the playthrough of any bonus (10 being the maximum unless SPECIFICALLY stated otherwise). If you place any wager of $10 or above, the bonus and any winnings thereof will be voided. The first deposit promotions are available only for your first 5 deposits at the casino. Each bonus must be claimed with its respective deposit (1st deposit bonus should ONLY be redeemed with 1st deposit at casino, 2nd deposit bonus should be redeemed with 2nd deposit, and so on). Failure to do so may result in bonus(es) voided and any winnings thereof. Unless otherwise stated, these offers may not be combined with any other bonuses offered by Sloto’Cash Casino. Players must wager the deposit and bonus thirty (30) times for the 200% bonus and twenty-five (25) times for the 100% or 177% bonuses respectively prior to any cash-outs. Only bets placed on Slots, Real-Series Video Slots (excluding progressive slots) and Scratch Cards count towards the wagering requirements of the bonus. While the welcome bonuses are active, the MAXIMUM bet allowed is $10 per SPIN. Wagering on any other game or betting over $10 per spin will void all winnings on these promotions. Upon redemption of a bonus, the bonus amount and deposit will become part of a player’s “Bonus Balance” until the wagering requirements are met. After the wagering requirement or playthrough is met, the “Bonus Balance” will be converted to “Withdrawable Balance”. The first 5 Welcome Bonuses are sticky- i.e. the bonuses are for play purposes only, to help you generate winnings but the bonus credits cannot be cashed out. The bonus amount received will be deducted upon withdrawal. Sloto’Cash Casino reserves the right to change or update the terms and conditions of these offers at any time and it is your responsibility to periodically check here for changes and updates. Player must deposit a minimum of $500 to qualify for this promotion. Players must wager the deposit and bonus thirty-five (35) times prior to any cash-outs. Only bets placed on Slots, Real-Series Video Slots (excluding progressive slots) and Scratch Cards count towards the wagering requirements of the bonus. Wagering on any other game will void all winnings on these promotions. Player must deposit a minimum of $20 or higher to qualify for these promotions. The maximum bonus for each coupon is $500. Players must wager the deposit and bonus twenty-five (25) times for the 100% TABLE1MATCH bonus and twenty-two (22) times for the 50% TABLE2MATCH prior to any cash-outs. Every $1 wagered on Slots, Real-Series Video Slots and Scratch Cards will count as $1 towards the wagering requirements of the bonus. Every $1 on any other game (except games excluded below) will count as $0.25 towards the wagering of the bonus.